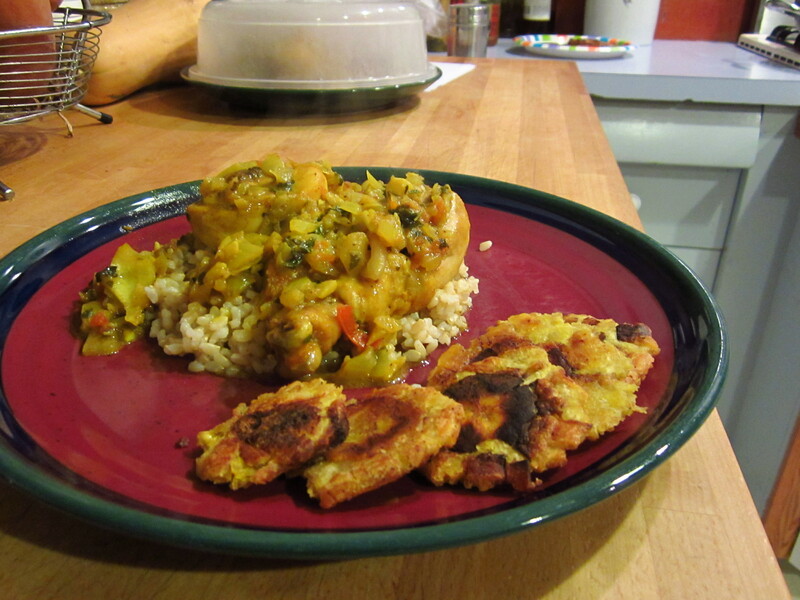 While making out this week’s menu, I stumbled upon a recipe for chicken curry from Trinadad. I love curry, Indian & Thai, but hadn’t tried any from another country, so I added it to my menu. I screwed up and didn’t allow the chicken to marinade as long as I should have, plus I should have removed the skin from the chicken legs, but it was still quite tasty. Add chicken to a large bowl and sprinkle with a generous amount of salt and pepper. Add the mustard. In a food processor, combine half the onion, the tomato, garlic and cilantro. Once everything is chopped up, add tot he bowl with the chicken and mix well. Allow to marinate for a minimum of two hours (best to do this the night before, throw everything in a zip-lock bag and put in the fridge over night). Add oil to a large skillet on medium heat. Combine the curry powder, tumeric, and 3/4 cup water. Mix until dissolved, then add it to the hot oil. Allow this slurry of spices to cook until it becomes thick like a paste, but not dry (if it gets too dry, add a little more water). Add the other half of the chopped onion to the spice slurry and allow to cook until the onions become translucent. Add the chicken, turning to coat. Cover and allow to cook for five minutes. Remove the lid and add 1-2 cups of water. Allow to cook for 20-30 minutes, turning every few minutes. Serve chicken curry over the rice. Be sure to use a spoon to scoop up the sauce for over the chicken and rice. Buy a plantain that has a green skin. If it’s too yellow, it’s too ripe. Make three cuts along the length of the plantain, then use either the knife or a spoon to pull away the peel. Once peeled, cut the plantain into one inch pieces. In a frying pan, over medium high heat, melt enough coconut oil to a depth of about 1/2 inch. Place the plantain pieces in the hot oil so that they are standing up and allow to cook until they start to look a nice brown. Flip over the pieces and allow the other side to brown. Remove the plantain pieces to a paper towel to drain. Using a plantain smasher…or, if you don’t have one, use two plates, place one piece of plantain on one plate (standing up) and place the other plate over it and press down. You will have a smashed piece that resembles a pressed flower. Put the flattened plantains back in the hot oil. Allow to brown on both sides, then remove to a paper towel. Sprinkle with salt and serve.